It has not even been a week since I was on top of the Pyramid of the Sun, but I already miss the peace and total serenity that seemed to enclose my whole body while I was there. They say this pyramid has a powerful positive energy at the top. You can watch people performing all kinds of rituals and doing energy cleanses. I was glad to visit for the second time with my mom and my friend, both of them eager to experience this major tourist attraction from a spiritual perspective. It was a great way to begin 2019. Teotihuacan is an ancient city that started out as a religious center. It became the largest and most influential city in Mesoamerica. There are a few translations for its name, my favorite ones being “Place of the Gods,” and “Place Where Men Turn Into Gods.” It is one of the most mystical places I have ever visited. While I have never been a fan of reading history, I am always fascinated by it when I travel. Not only do I find facts and records more interesting while I am experiencing something rather than reading about it, but stepping on such ancient ground that was populated by a civilization which now seems so far away from our modern reality is truly mesmerizing. My horizons are always expanded with a fresh view of modern life through historical sites and records. Getting to Teotihuacan is easy from the city. The pyramids are about 25 miles from urban Mexico City. You can take a bus (for around $5) from the station “Terminal Central de Autobuses del Norte,” which is right outside the yellow metro line stop “Autobuses del Norte.” Once there, get your tickets right next to “Sala 8” which is the gate your bus will leave from. Going to Teotihuacan and returning by Uber is also possible, though finding an Uber back to the city might take a little longer depending on the day and time you go. Tickets to enter the pyramids are about $4. Even if you are traveling on a budget, there is really no good reason to justify skipping this historically significant site. Once we arrived, I was stunned by the entire experience even though it was my second time there. Climbing up the Pyramid of the Sun was a physically challenging task for many of us tourists, but worth every drop of sweat. Once you arrive to the top, you will get the highest view of Teotihuacan. We decided to place our hands on top of the pyramid, which is what I saw many people do the first time I visited. The idea is that all the strong, positive, spiritual energy comes out the very top of the Pyramid of the Sun. Whether your mind is all for the mystical beliefs or the scientific facts, I find it healthy to open up to other ways of perceiving the world. It was this openness that led us to get an energy cleanse from one of the indigenous vendors after we bought a few volcanic stones. Energy cleanses can also be done on the weekends in the Zocalo area in the historic center of Mexico City. Mexican culture has many different indigenous rituals meant to bring health, wealth, and positivity into your life. Before climbing the pyramids, I bought a black obsidian necklace. Polished obsidian was used by the Aztecs to be able to look at the sun directly and study it. It was also used to make tools and jewelry. The indigenous vendor taught us how to use this volcanic stone to cleanse our energy. He moved the black obsidian stone in clockwise motion, massaging the abdomen, the back, and the head area. When the man placed the crystal on top of the head he gently flicked the obsidian’s tip with his fingers, concluding the cleanse. All this was meant to absorb the negativity out of you, whether emotional or physical (like pain). He then explained that we should put it on top of the Pyramid of the Sun to charge it, and we did. I was swooning with this experience. The perfect weather also helped me reach the calmest state of mind I had felt in months. In all the months leading up to the holidays, and the holiday season itself, I was more anxious than peaceful. The unexpected arrival of multiple family members was both happiness-inducing and guilt-inducing as my mind was filled with all the “I should do this, but I don’t want to do this” type of thoughts. I have also been dealing with some serious anxiety attacks that made it hard to fall asleep at night. I do not know if it was the cleanse with the obsidian stone, the energy from the top of the pyramid, the lovely company, or just spending a gorgeous day out in the middle of so much beauty… After the trip, I would find myself turning negativity into positive and empowered thoughts more quickly than usual, along with sleeping soundly each night. Climbing up to the Pyramid of the Moon is a little less momentous, but the view had me rushing up the steep steps. While the Pyramid of the Sun is taller, the Pyramid of the Moon shows a more breathtaking view because you get to see the Pyramid of the Sun, and how imposing it looks against the desert backdrop. The Pyramid of the Moon, I learned, is actually 7 pyramids built within each other like a Russian Doll. One of the theories for this is that as Teotihuacan grew, other cities in Mesoamerica grew as well. Adding on to the Pyramid of the Moon to make it bigger was a way to maintain Teotihuacan’s status. The most mysterious and appealing part of Teotihuacan’s history is that its origin is still uncertain. The Aztecs found it abandoned and occupied it as refugees from a volcanic eruption. This is what makes the Pyramid of the Sun (216 feet tall) and the Pyramid of the Moon (140 feet tall) even more mysterious and appealing to travelers around the world. 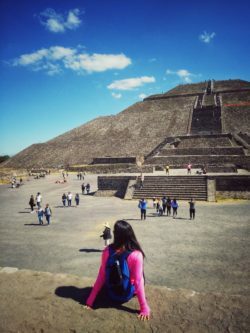 Spending a day in Teotihuacan is one of the most spiritual and educational experiences I have ever had in my four years as a nomad. It is days like these, where both historical facts and spiritual beliefs are combined that my mind, body, and soul feel stimulated and enriched. I hope one day you will get to experience this significant site, and be open to all the enriching rituals Mexican culture has to offer. Until then, let’s keep exploring the world around us and doing what we can to become more positive human beings that can contribute to our planet rather than take away from it.